To complement the general and cosmetic dentistry services offered by Persona Dental, we have prepared this list of answers to the most commonly asked questions about dentistry and dental health. At every regularly-scheduled dental appointment at our office, we will carefully check your teeth, gums, mouth, and throat. Acids can demineralize a tooth — that is, create a weak spot that develops into a cavity. Fluoride helps promote the opposite process, called remineralization, which can reverse the very early stages of tooth decay. Pain from sensitive teeth often comes and goes, but if you experience constant pain, you may have a more serious problem. If you have sensitive teeth, please contact us to discuss your symptoms. We can help determine the cause of your pain and develop a course of treatment. Nursing-bottle mouth, also known as baby-bottle tooth decay or baby-bottle syndrome, can cause a baby’s front teeth to rapidly decay, which can lead to a lifetime of dental difficulties. Preventing nursing bottle mouth is easy: If you give your baby a bottle at nap or bed time, simply fill it with plain water rather than formula, milk, or juice—never let your child fall asleep with a bottle filled with a liquid other than water. In addition, check your child for brown spots near the gums because they are a warning sign for tooth decay. General, preventative dentistry should start early. A child’s first dental visit should take place at 1 to 2 years after birth. Regular fluoride treatments, administered by a dentist, are especially helpful in strengthening enamel and arresting tooth decay for children. Dental sealants are quickly applied by preparing the chewing surfaces of teeth, then painting on the sealant. The sealant material bonds directly to the tooth and hardens with the aid of a special curing light. Dental sealants hold up well under the force of chewing, and they provide protection against cavities. During regular dental visits, we will check the state of sealants and re-apply them if necessary. Dental sealants are particularly effective for protecting children's teeth. The first permanent molars emerge when a child is about 6. A dental sealant treatment performed shortly after these first permanent teeth emerge protects the teeth from developing cavities. Another good time for applying sealants occurs when a child is about 12, when the second permanent molars emerge. Cosmetic dentistry is more popular than ever before, and for good reason. Today's cosmetic dentistry techniques yield impressive, long-lasting results. Dentist-supervised teeth whitening systems such as Zoom!® are widely considered to provide the safest cosmetic dentistry treatments. Teeth whitening is a conservative method for completely making over your smile. Chairside teeth whitening procedures are performed with a specially formulated peroxide gel that allows oxygen to permeate your tooth enamel, lifting stains. The structure of your tooth enamel is not affected. The most common side effect is temporary tooth sensitivity. Numerous cosmetic dentistry techniques exist that can provide “instant orthodontics” that require no braces at all. Composite bonding and the application of porcelain veneers are both conservative ways to mask the appearance of crooked teeth. Be aware that these cosmetic approaches cannot address orthodontic issues such as an overbite, underbite, or crossbite, and therefore are not suitable for every patient. If you have crooked teeth and would like to achieve a more beautiful smile through premier cosmetic dentistry treatments, please contact us for a consultation. At this meeting, we will diagnose your specific issues and recommend a course of treatment. We apply an artistic eye to smile makeovers, and they always consider your facial shape, the natural form of your teeth, and other factors so that you achieve optimal results. We invite you to view our smile makeover gallery to see the cosmetic dentistry results we are able to achieve. Missing teeth is a common complaint among our patients. Luckily, our practice features several cutting-edge methods of filling gaps in a patient's smile. Nearly anyone who is missing one or more teeth, and desires a superior, long-lasting aesthetic result is a good candidate for dental implants. However, patients must have enough bone to support and stabilize the implant. Some individuals who have suffered bone loss as a result of gum disease or another condition may need bone grafting before a dental implant can be placed successfully. Going to the dentist does not have to be associated with anxiety and discomfort! 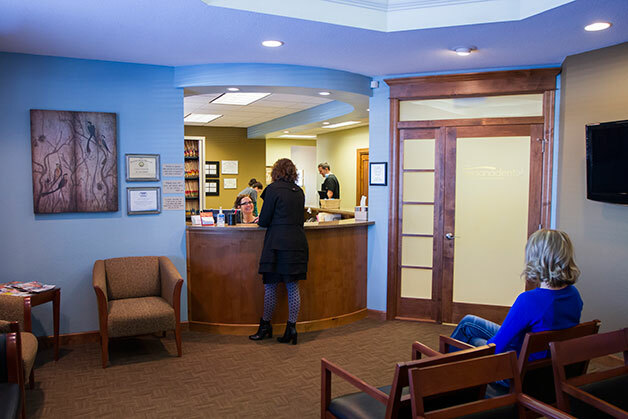 We take several steps to make sure our patients are relaxed and comfortable while receiving the best in modern dental care. Dental treatment by Persona Dental is personalized, advanced, and more affordable than ever before.